The appeal of “Jurassic World” always was and will always be finally getting to see a working dinosaur theme park. A vision the eccentric billionaire John Hammond always wanted. And it is a rather awesome place; not unlike a dinosaur-themed Disney World. I'm not sure why it could be so successful since the terrible incidents depicted in the first film (and it's debatable whether this fourth entry most likely ignores parts 2 and 3) and the fact that you have to fly half way around the world to visit. But it's a pretty amazing place. You can kayak down a river with the friendly dinosaurs. Watch a Shamu-like aquatic presentation complete with feeding time with a great white shark. Oh and the shark is the food. It's a park filled to the brim with tourists and everything seems to be running smoothly. And then, as is this franchise's mantra, all hell breaks loose. It must be said that one must reign in their expectations when it comes to this fourth entry. No new Jurassic Park sequel will ever beat the original especially if you consider it a life-changing experience as most people between the ages of 20 and 40 will tell you. “Jurassic World” feels like it was designed with most of those people in mind who always wondered what a real working dinosaur park would be like. The film sets up it's premise rather unspectacularly but efficiently. 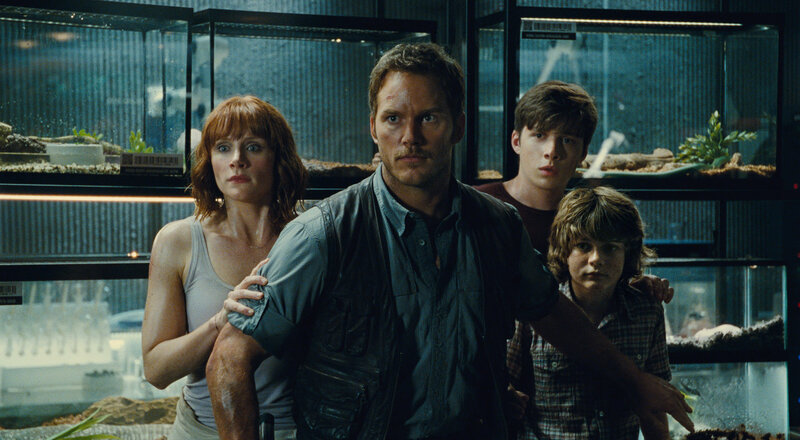 Two brothers are shipped off to visit their Aunt Claire (Bryce Dallas Howard) who is the operations manager at Jurassic World. It's a fully functional, and successful, dino theme park on Isla Nublar (the same location from the first film). 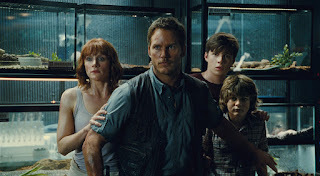 Claire is a busy woman though, as she's preparing a new attraction featuring a genetically modified hybrid dinosaur that is bigger and meaner than anything they've created before, so she doesn't have much time to spend with her nephews: the teenage Zach (Nick Robinson) and younger Gray (Ty Simpkins). Park owner Simon Masrani (Irrfan Khan) comes to check out the new dinosaur but insists Velociraptor expert Owen Grady (Chris Pratt) check out the vicious dinosaur's enclosure for safety measures. If you're guessing that this new dinosaur, named Indominus Rex, somehow breaks loose and wrecks havoc upon the entire park you'd be correct. To say much more would ruin all the fun. There is a side story about InGen security guy Vic Hoskins (Vincent D'Onofrio) who wants the raptors, who Owen has been working with to train (don't worry, they're still pretty lethal, intelligent, and scary) for other reasons. And then there's the engineer played by BD Wong, the only character from the first film, who has a more “important” role. Meanwhile, Claire’s nephews sneak off from the care of Claire's assistant who was tasked with watching the boys. And let's just say they get onto the gyrosphere ride at the worst possible time. “Jurassic World” somehow works really well. Howard and Pratt are perfectly cast and give convincing performances. There's a slight love story involved but it's nowhere near the corny and forced storyline shoehorned into many movies like this. Sure the film isn't directed by Steven Spielberg, but Colin Trevorrow makes an adequate replacement. He hits all the right buttons with a script filled with delightful Jurassic Park callbacks. This film truly feels like the direct Jurassic Park sequel we've all been waiting for. The action scenes, while not as iconic as the first film, are well staged and memorable. The effects are also well-done but never as awe-inspiring as the first time we saw those Brachiosauruses in 1993. Michael Giacchino's score is efficient with just enough John Williams beats to be familiar and comforting. Theatrical Trailer for Jurassic World on TrailerAddict.